Argentine Tango is one of the most romantic and intimate dances, demanding a close connection between partners. All movements are led by men and women have to follow with their sensitivity and awareness of her leader's energy. When you learn with us, you will discover that you don’t need to memorize any choreography. In tango, people can dance with a stranger and feel perfect connection if they can lead and follow well. That’s why Tango is said to be a 3-mins love affair when you dance with all your heart. In these introduction courses, the foundation elements of Argentine Tango will be taught, such as the Basic Steps, Cross, Ocho and Parada among others. And we will focus on some core techniques as well, like walking, and framing techniques in leading and following. In addition, we will also do demonstrations to different kinds of music, like Vals, milonga (fast Tango music), Nuevo Tango music and also traditional Tango music. After this course, students should be able to start dancing in milongas (Tango parties) and know more about different kinds of the dance and music. No need to bring a partner with you, partners are rotated during each class. Suitable for students who has finished Beginner courses, and those who are retaking beginner courses. Improver level will focus on connecting elements so that students can start dancing to a song with simple steps, getting students more comfortable with dancing in close embrace. Suitable for students who has finished at least 1 cycle of improver level, and those who are re-taking improver level at the same time. Students should already know ochos, media luna, basic giros, sacadas. 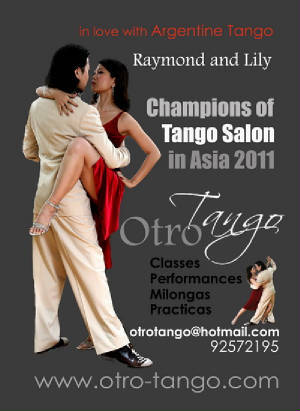 Students should already have milonga experience. Intermediate level will focus on more movement concepts like boleo, ganchos, barridas... etc. Through these movements, students will be trained with more techniques and more options in the dance to handle dance floor navigation. Suitable for students who has finished at least 2 cycles of intermediate level. Advance level will focus on more demanding movements as well as doing the basic movement with higher quality. Suitable for students who has finished beginner level or above. Please wear pants and bring a pair of socks, and of course Tango shoes to classes. Floor works and stretching exercises will be included to strengthen your body/leg power. Different solo exercises will be used to get you (and your body muscle) understand the techniques in tango with details in the movements including walking, ochos, giro, boleo, ganchos, etc. Embellishment will also be introduced to make you look more elegant and stylish in dancing. Beside, secrets of inducing more sensual feelings in the dance will also be shared. The exercises taught in class can be done at home, it's a good way to prepare ourselves to be able to do the movement on our own with perfect balance and with ease, so that when we dance with men, we can concentrate on following their lead, and so, you can be more sensitive, and at the same time, be naturally elegant! This class suitable for improver or above, as we have to go back to the fundamental techniques again and again to perfect them and refine them with more details. We shall work on walking, embrace, energy, alignments, connection... and all other aspects that make you dance with better quality instead of with quantities of steps or embellishments. 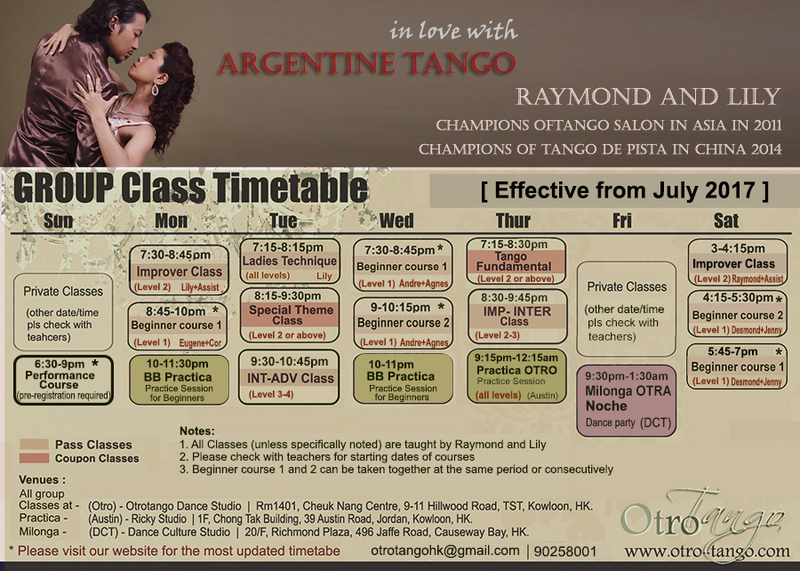 This class suitable for those who are comfortable with basic leading and following in tango. We shall work on elements in milonga and vals, musicality, common patterns of movements, special characteristics of them, qualities of them... to help you be able to run into the dance floor instead of sitting down for the whole tanda. Milonguero ochos, giro, and common movements in close embrace without pivot. How to dance to the music with beats, rhythm, melody, phrase ending, pause, dialogues, quality of contrast, sustaining, staccato, how to handle adagio, variation etc... listening as well as getting your body and your partner into music. Sunday classes at Austin Road Ricky studio - 1F, Chong Tak Building, 33-39 Austin Road, Jordan, Kowloon. Stage Sequence class can be joined individually at $200 single class or 1 class coupons. All those who wish to perform MUST join all the performance classes AND Stage sequence classes AND rehearsals, if you really cannot join any of them, please let us know, we shall handle them separately. Stage sequence class are designated for those who want to learn but may not want to perform. These classes will have related movements and sequences used in the performance course. You can take them separately with or without partners, or sharing partners. 2.The course will focus on one group choreography (this time a slower emotional song) with Tango Salon and some Stage movements. Some parts in the choreography will be designed for different level of dancers. If you are not sure about if you are at a suitable level to join, you can discuss with us. 3.Additional rehearsals after completing the course might be arranged to prepare for the performances in the coming events. 4.You can join the classes even if you do not intend to do any performance, it's still a good training. But please let us know in advance. 5. The final selection of dancers for different shows depend on the students' attendance and performance. Please send the following information to Lily 92572195 by either whatsapp message or facebook message or email to otrotangohk@gmail.com. 4 - if you choose to perform or not, please state.